Part of James Anderson’s matriculation into the 76ers has been adjustment. Namely, evolving into a shooting guard who doesn’t shoot all that much. Anderson has attempted only 46 shots through the Sixers’ first seven games, an average of 6.5 shots per game. 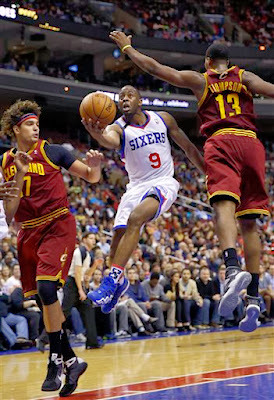 And while he’s hitting at a 41-percent clip, Anderson has become more of a defense-first option for coach Brett Brown. That doesn’t come as a surprise to Anderson’s former coach. Anderson, who played for the Spurs for two seasons, from 2010-12, is averaging 6.9 points and 3.9 rebounds in 33.4 minutes per game, a total that demonstrates his penchant for putting the ball in teammates’ hands. He’s shooting 41 percent overall (19-for-46) and 32 percent from 3-point range (8-for-25). There’s a chance Anderson, the 20th pick in the 2010 draft, would’ve latched on with San Antonio if not for depth on Popovich’s roster. And Anderson is OK with that.